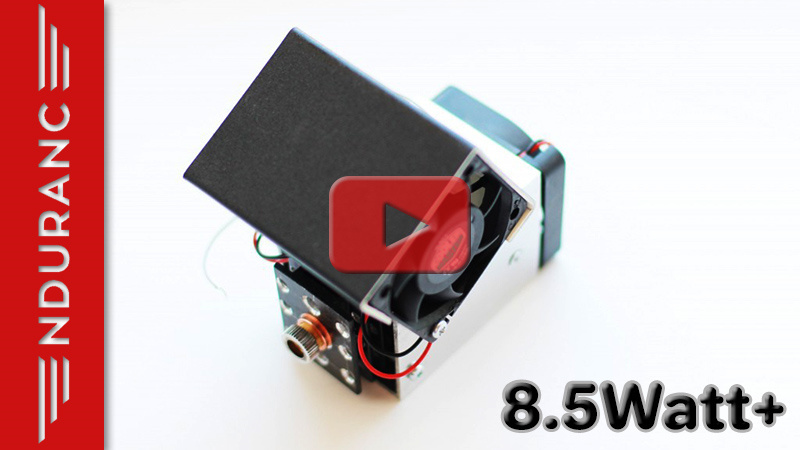 The Endurance 20 watt (20000 mW) diode laser add-on for 3D printer / CNC mill. The first double beam laser for 3D printer/CNC machines. Now easy engraving on metallic surfaces, stone, and ceramics. Compatible with many 3D printers and CNC routers . Are you looking forward to expanding abilities of your 3D printer or CNC machine? Do you want to do laser cutting and laser engraving in the same way as a Co2 laser machine does? Get an amazing experience with an Endurance 20 watt double beam laser add-on. Engrave on metal, wood, plywood, leather. Cut hardboard, cardboard, fabric, wood, plywood and acrylic up to 8-10 mm thick as if with a Co2 laser. №1 customer support in a maker space. Use the same slicers you always use, such as Cura, Repetier, Slic3r, Simplify3D or the CNC software, such as Mach3, etc. To prepare a g-code use the Endurance plugins or T2Laser software. Buy The Endurance 20 Watt (20000 mW) 445 nm double-beam laser right now! A laser driver is one of the most important components in the laser module. The laser driver controls the voltage and the current that goes to the laser diode itself. It is important so that the laser driver sets and keeps the voltage and the current stable. It keeps the laser diode safe. Also, the laser driver turns on/off both lasers at the same time. We add a Zener diode as an additional laser diode protection. TTL wires (PWM) are also added to the laser driver. With a TTL (PWM) you may change the laser power (duty ratio) in the range of 3.5V to 12V For 20-watt laser module we use special tuned and set-up two step-down (buck) DC/DC converters with a current stabilizer on board. A buck converter (step-down converter) is a DC-to-DC power converter which steps down voltage (while stepping up current) from its input (supply) to its output (laser diode). All Endurance driver/laser control boards are very reliable and been tested before shipment. What is so great about the Endurance 20 watt laser module? The first such powerful unit on the market. Compatible with many 3D printers / CNC mills. Easy to install and mount. Everything that you need to know about additional Endurance accessories. always wear red or green goggles when you operate the laser. Remember Endurance lasers are class 4 items and must never be aimed in any live specie. an additional power supply for the fans. Endurance Presents A Brand New Double Beam 20 Watt Diode Laser Attachment. Principle of a laser beam combining. The engraving was made using a 20-watt laser with a special chemical paint. Do you want to engrave on metals and more? As powerful as Co2 and fiber laser machines. Unlimited possibilities for home and business engraving. Endurance presents a 20-watt double beam diode solid-state laser attachment for 3D printers and CNC machines. The uniqueness of the product is that we focus two combined beams at one spot doubling the laser power. The 20-watt laser attachment consists of 2 x 10-watt modules installed on one aluminum flexible plate. By focusing two combined beams at one spot you get a higher power & temperature to speed up cutting, engraving and engrave on metallic surfaces without additional chemicals. An Endurance 20 watt semiconductor laser add-on device is one of the most powerful units on the market with 445 nm wavelength and relatively small sizes enabling easy installation on almost any 3D printer and CNC router. 2 x 10-watt lasers are aimed at one spot by adjusting the laser direction over X & Z axes using M6 and M4 screws on the aluminum plate which holds both lasers very tightly. Proceed with a double beam 20 watt (20000 mW) laser invoice request! The 20-watt laser operates on 9 – 24 volts. There is no need for an additional power converter. An air assist can be added upon request. The Endurance 20-watt laser module is the best solution when it comes to a very fast engraving similar to a Co2 laser machine. The 20-watt laser engraves on stainless steel and soft metals. The 20-watt laser cuts as fast as a 40-watt CO2 laser. – Combined high laser power focused at one spot. – Portable and compatible with many 3D printers and CNC machines. – Easy to run and mount. It is the same 10-watt laser that is used in this model, that is why a 10-watt laser datasheet is relevant. Do you want to know more about abilities of our 20 watt double beam laser? The 20-watt (20000 mW) laser is already focused and ready to go. The preset focusing range is around 6-8 cm. You’ll get a note with the laser specifying the focus range for the particular laser module. Endurance is the first company presented a double beam laser for 3D printing enthusiasts and CNC makers. Unlike the other Endurance models, a 2 x10-watt laser has ultimate power and opens the ultimate abilities of your 3D printer or CNC router. The Endurance 20-watt lasers are very reliable. Every unit is carefully assembled and individually tested what decreases the probability of defects. An effective cooling system with a manually built heatsinks keeps the laser diode cold during continuous operation. The heatsink is made out of a special aluminum alloy and the laser diode is installed inside and pressurized what keeps the best contact and removes heat very effectively. All Endurance lasers are tested before shipment. We take care of our customers and offer ultimate customer support by answering any questions about connecting, mounting, pinouts and generation of g-codes. You are welcome to try our 20 watt laser beam laser. Get a 30 days trial period. Endurance cares about your safety and your comfort that is why we ship protective goggles with every order. You must also follow basic rules of safety and never use the laser outside your 3D printer or CNC machine, never aim it at anyone. We recommend wearing goggles at all the times you operate the laser. If you need additional protection we recommend adding a door or a box out of green, red or black acrylic. 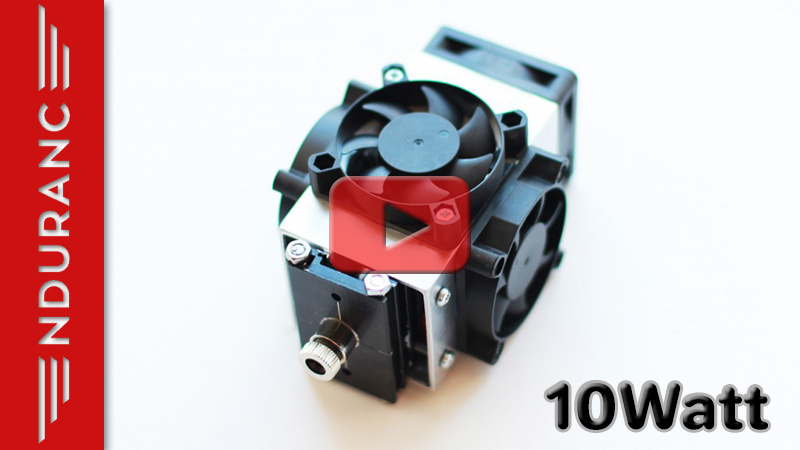 The Endurance 20-watt laser is compatible with many 3D printers and CNC machines. The 20-watt laser module is bigger and heavier than the other Endurance models but is still good for installing. Proceed with a invoice request for 20 watt (20000 mW) laser module! Why do our customers buy a 20-watt laser module? It is the first laser module with 20 watt (20000 mW) 445 nm optical power output. We deliver everything you need to get started in one package. Very easy to convert your 3D printer/CNC router into a laser cutting/engraving machine. The Endurance 20*watt laser can work continuously up to 48-72 hours. Endurance provides an ultimate customer support in many languages. Do you stil have questions or concerns about 20 watt laser module? Aluminum plate for 20 watt laser (laser beam combiner mechanism). You need 3 separate power adapters: 2x 12V 5A for Laser box + 12V 1A (2A) for the fans. Stay in focus. 20 watt . laser has a fixed focal range. Check the schematics of your electronic control board to connect the laser throught the laser box (connect to fan / spindle or laser pins). Endurance 20 laser can be installed on any 3D printer and CNC mill. Ready for usage in 30 minutes. Buy The Endurance double-beam 20 watt (20000 mW) laser right now!